Daredevil skaters have been riding their skateboards down stairs probably since the day after skateboards were invented. Now, finally, someone has created one that is actually meant to do that. Po-Chi Lai, a Royal College of Art graduate, invented Stair Rover by subtly tweaking the classic design. He simply added another wheel to each corner, turning a skateboard into an eight-wheel deal. 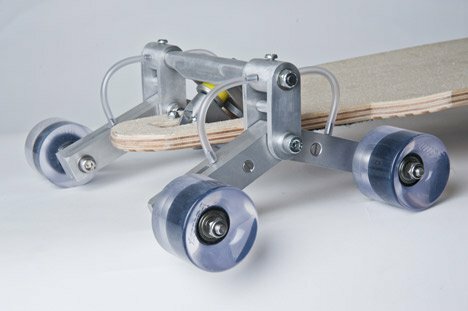 Those extra four wheels work to keep the skateboard stable and level as it goes down a flight of stairs. The chassis is flexible and sort of snakes down the stairs in a surprisingly graceful movement. See more in Mods & Custom or under Transportation. July, 2012.